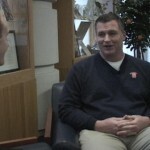 Clay LePard (CL): Thank you for being with us Coach Marrone for this edition of 5 Questions with CONNECT. First off, how does the success of the football team affect the psyche of the Syracuse Community? Doug Marrone: Well I think it’s important to me; it goes back to my days in New Orleans. When we first came there after Katrina, there was a lot of tough things going on economically within New Orleans and then coming across and having that season where we went to the NFC championship game. Just being able to pick up the spirits of the people, of where they were able to get away on a Sunday and forget about the problems of what Katrina caused really could pick up a community and really a whole area. So I think as far as the Syracuse football program, oh which we will do, have success on this football field. I think it will pick people’s spirits up and get them excited where they can go and be proud of their team. CL: You went to school here, you played football here in the 1980s. How have you seen our school, but also our community, change over time? Marrone: I know that from a university standpoint, we have done so much to increase our academic integrity as far as our schools are much more higher rated now, and Chancellor Nancy Cantor has done a great job on our campus. We’ve expanded our campus with new buildings and our professors are great; they were great when I was here, so I’m excited about that relationship we still have. And then the community – it’s been tough. We’re going through some tough economic times but we survive here in Syracuse; we got to work, we get our hands dirty and we get things done. So I’ve been very excited, you know, being on campus and being off campus in this community. 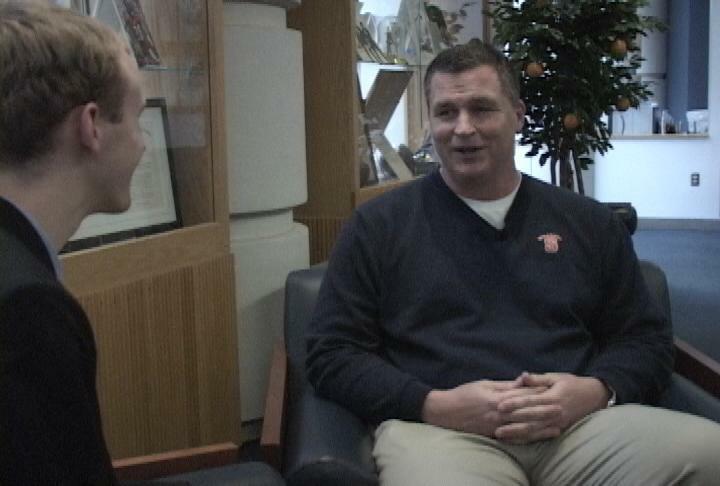 CL: When you applied for the job as head coach at Syracuse University, you kept a folder of current high school football players to keep an eye on in the Syracuse area. How important is it for you to recruit locally? Marrone: Well I think it’s important for us to recruit locally obviously as a radius of 250 miles, starting here working our way out throughout the state. It’s important because it’s such an easy sell. We have a great school academically; we have such a great campus, we have great students here – people who go on to become leaders in the industries all over the country, if not the world. It’s an exciting standpoint for us to get someone close who can visit the campus multiple times, and it gives us a better chance to get those kids here. CL: If you weren’t coaching football, what would you be doing? Marrone: I’d be involved in athletics at some point. I don’t know if it would be coaching, it might be administration at some point. If it wasn’t that, it would be law enforcement. Growing up, I always wanted to be a state trooper. So, it would be one of those roles for me. CL: Even though so many people know your name and even though you’re so recognizable there has to be something people don’t know about you. So what would people be the most surprised to know about Doug Marrone? Marrone: I would say it’s probably where I eat. I have three young children; they’re eight, six and four [years old]. So we go quite a bit to Red Robin, Friendly’s, to McDonalds. I probably visit those establishments more than any other ones because of the children. We go to bowling alleys, movie theatres. I’m out in the community quite a bit, and I know when I walk into Friendly’s or Red Robin, people always say “Coach, what are you doing here?” “Well I’m doing the same as you with your children.” I look for children friendly establishments and that’s what I look for with my children. CL: Thanks Coach. This has been 5 Questions with CONNECT.